Now that Catalyst 10.8 drivers have fixed the Radeon HD 58xx tessellation bug, I can publish comparative tables for TessMark, the OpenGL 4 tessellation benchmark. The following results are valid with the 0.2.x branch of TessMark. Use these results as a quick way to rank your graphics card regarding the GPU tessellation. – All graphics cards have been tested with default clocks. Here are my GTX 460 vs 5850. How motherboard/CPU dependent is TessMark? If this is the wrong place to ask the question from my previous post, where is the right place? No, it’s the right place. For low tessellation levels TessMark is more CPU dependent than for high tessellation levels. You have to examine the scores to forge your own idea. For my part, I only tested with one CPU (core i7 960) and then I can’t give you an accurate answer. @Arctucas: are you sure you use both GPUs of your GTX 460 SLI ? Seems only one GPU is used. Be sure to start the etqw.exe version of TessMark to take advantage of SLI. Thanks for the tip. I have edited my link to reflect using etqw. Using the new 260.63 Forceware, I am having an issue where my scores are lower using etqw than the tessmark scores. I verified that both GPUs are being used in etqw. Is this because of the new driver? Im using a HD5970 overclocked at 850mhz and 1200mhz and at 1920×1080 at 0xAA and moderate Tessalation and I am getting 360 FPS ?! Im using Catalyst 10.9 . What could the problem be ? Im using the etqw . The rest I think doesn’t really matter as there the bottleneck is because of the too small triangle sizes. Few pixel triangles always kill the GPU (it is visible that it kills ATIs better than NVIDIA), but anyway, it never worths to create pixel sized triangles. I think normal mode is already far too much. Is there a version of this that will use more than two VGA’s?.I am running 4 x 5850’s and it is only using two cards. 2 way SLI. 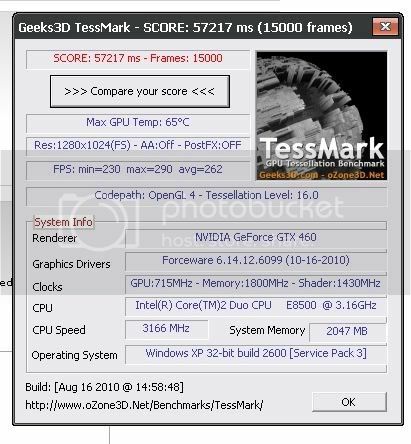 Tessmark didn’t report the overclock correctly: it’s 980/2400, the cpu is at 4.4Ghz fwiw. Intel(R) Core(TM) i3-2330M CPU @ 2.20GHz is very slow from i5 or i7 . 1080p insane x64 msaax8/nvidia fxaa v2. GPU:nVidia GeForce GTX 660 MSI Twin Frozer OC. GPU:MSI Twin FroZer GTX 660 Overclock. Memory: 16gb G.Skill Ripjanews 2133 Mhz 9/11/. tengo score: 2215 points – time: 6000 ms. que significa ?